These are simple to make and are sooo fun to eat. My kids thought it was so funny that they got to eat "crayons" (something we're constantly telling the baby NOT to do!). 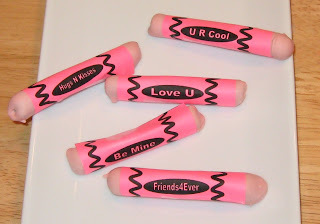 You can put several in a Ziploc baggie with a handmade note saying "You Color my World" for an easy class valentine treat. I'd make a few different colors (red, white, etc) but the girls had too much fun with pink so we just went with it. :) These would also be a great "C" snack for preschool or a great "back to school treat". Have fun! 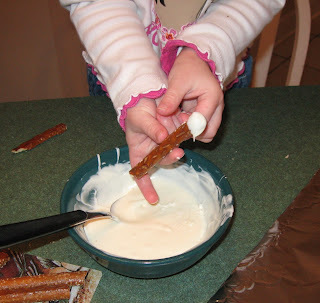 Break or cut pretzel rods in half. Melt candy melts or chocoalte chips in microwave on medium heat for 1 minute. Stir and continue cooking at 15 second intervals until melted. Add a few drops food coloring if desired. 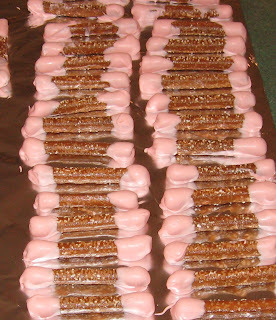 Dip ends of pretzels in melted candy. Place on wax paper or aluminum foil to dry. When dry, wrap with crayon label and secure with tape. You can download the labels I made here. "O" is for Orange Owl Cookies!